One of the things I hate is not using up all food that I’ve purchased – especially if it’s something I really like! But sometimes it happens that I can’t quite get to everything before it begins to get past the prime eating stage. With some things I will try to pop them in the freezer but sometimes I forget or don’t realize that they were on their way out until it’s too late. That just happened to me with a lovely baguette from Tall Grass Bakery that I purchased at the U-District Farmers’ Market this last weekend. This morning I was going to slice off a few pieces for a little toast with my tea but when I started to slice the loaf I realized that it was pretty dried out but not yet hard as a rock! So I decided to make a sweet bread pudding. And this is one of those times when having fruit in your freezer really pays off! Each year over the growing season I freeze whatever local produce I can get my hands on – some of it comes from family and friends, some from Farmers’ Markets. Even if you don’t have access to local produce or don’t have the room to freeze and store it there are lots of good alternatives at your local grocery. Keeping just a couple bags in the freezer can really help out. Adjust this recipe based on how much bread you have to use – this one is just based on what I came up with this morning. Mix the cream, milk, eggs, vanilla, white sugar and cinnamon. Add a pinch of salt. 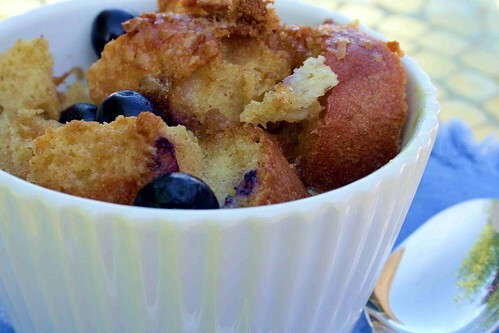 Put the bread cubes in a medium sized bowl, pour the cream mixture over the top and toss well. Let the bread sit for about 30 minutes so that it can absorb much of the liquid. Meanwhile butter 3 – 12 oz ramekins. Preheat the oven to 350°F. Add a layer of bread and then toss in several blueberries. Add another layer of bread and more blueberries. 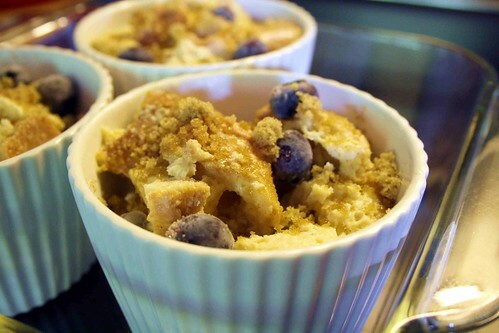 Repeat until the ramekin is full, ending with blueberries. Pour any remaining liquid over the bread in the ramekins. Sprinkle each ramekin with a little brown sugar. Place ramekins in a flat baking dish and then fill the dish about half way with hot water. Place the baking dish in the oven and bake for about 25 minutes, until the pudding is solid. Remove from the oven and serve warm or at room temperature.